Founded in 2010 by Robert Stansell III and Timothy Welsh, Emporium Design is a fully integrated, forward thinking design-build firm specializing in transforming spaces to reflect the passions and philosophy of each client. Emporium Design is a forward thinking design-build firm, focusing on conceptualizing and building some of the most alluring and innovative places where people shop, eat, drink and be merry. 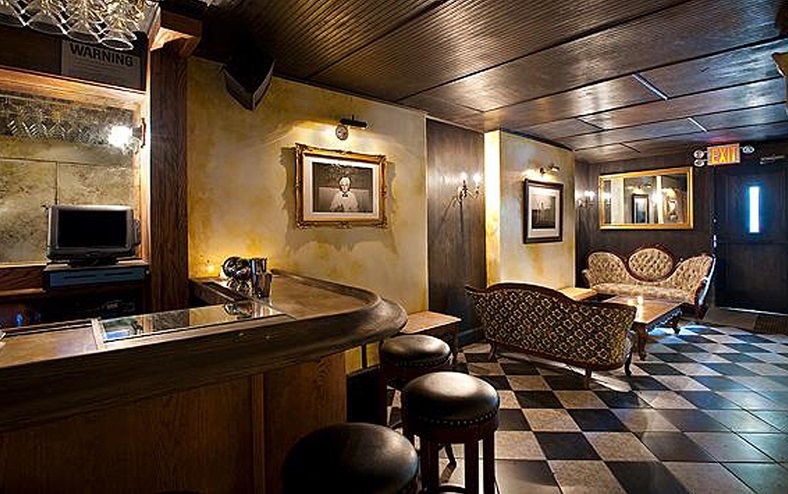 They are responsible for some of New York City’s most iconic watering holes such as Blind Barber Manhattan and Brooklyn, Bushwick’s Forrest Point, and Boulton & Watt. Whether it be a trendy lounge or restaurant custom fixtures or furniture pieces, or modular retail pop-ups, Emporium’s client's vision, culture, and budget serve as the foundation for each of their projects. For more information please visit emporiumdesign.com, Emporium Design on Facebook and @emporiumdesign on Twitter and Instagram. Tell us about Emporium Design. What inspired the idea and what is your vision for the company? We are college friends, each a registered architect with a broad portfolio of experience with large, corporate firms. After a bunch of years, we teamed up after work and on weekends to help a few friends design and build their own restaurant and bar. The investors were happy, the design was very well received, and we had a lot of fun. A few of these moonlighting projects later, we resigned from our corporate positions and launched Emporium Design. What is it that you enjoy most about hospitality design? The challenge. Hospitality design combines the intimacy, warmth, and attention to detail of residential design, but with the unique -- and usually highly specific -- program requirements and mission-critical demands of a retail or commercial project. What strategic partnerships/marketing strategies have you implemented that have attributed to Emporium Design's success? We are lucky to have formed a lot of great strategic relationships with consultants, vendors, fabricators, and subcontractors over the last few years since launching Emporium, allowing us to increase our reach and resources without prohibitively extending overhead or compromising a project or product. We like to think that people enjoy working with us for a number of reasons, including that we care about what we are doing and believe in recognizing and crediting all who contribute positively to the project. Social media is a very powerful tool that makes recognition very easy and organic. Surround yourself with good people, work hard, and good things will happen. Be straight up and honest with your clients – don’t sugar-coat inconvenient realities or tell them what you think they want to hear, especially in terms of deadlines, budget, and schedule. Your advice to an aspiring entrepreneur/interior designer? Set ambitious, but realistic, goals and milestones for yourself and your company. We are dedicated to a linear hierarchy with a flexible, casual, and collaborative office culture. It may sound cliché or overly simplistic, but it’s pretty simple: we care about our each other, we care about our clients, and we care about what we’re doing. This mentality is contagious and fosters an environment in which everyone is actively engaged and invested in the success of each other and of each of our projects. It is very important to acknowledge and celebrate individual and project success along the way – even if it is something as simple as a hand-written note of appreciation. Chef Dave Rotter’s short rib eggs benedict on bone marrow toast with a ‘Boulton & Watt’ house Bloody Mary. There are three books (seriously). And we’re both in the process of reading and re-reading them. Anthony Bourdain’s “Kitchen Confidential”, Harvey Penick’s “Little Red Book: Lessons and Teachings From A Lifetime In Golf”, and “Welding for Dummies”. We are both incredibly lucky to have parents who have set great examples – both personally and professionally – of how to achieve success by working hard and doing things the right way. Designing and fabricating light fixtures and furniture. We’ll be launching an e-commerce site soon to offer some of our one-of-a-kind designs to consumers. One example are shovel heads that we found in a mine, we turned them into lighting sconces for one of our design projects. We liked how it turned out so much, we went back and purchased all that the mine had. We’ll be offering this lighting fixture for consumers soon. One of our current projects is a dream home along the rocky cliffs of the island of Anguilla, a British territory in the Caribbean, so anytime we are able to spend on the ground there is really quite amazing. What’s the key to a successful collaboration between designer and client? Honesty. Whether that be in terms of program, design palette, schedule or budget, honest and open communication is critical. Constructive debate is a good thing. What's next for Emporium Design? We’re on a path that we hope leads to designing and building boutique hotels or small resorts. It would be great if that happens sooner than later but we’re going to continue honing our craft and having a good time while doing it.